What is Microtronik AutoHex II? Microtronik AutoHex II is a diagnostic scan tool for vehicle especially for BMW cars.It support ECU programming and coding,key programming and many other functions. BMW Key programming by Autohex II is done by OBD, No dump is required. including CAS with latest update and all keys lost. it supports all BMW Models as well Mini cooper. You must be connected to the internet before start using BMW Ecu programming procedure, as Autohex II software will need to download the required data flash from Microtronik server database. 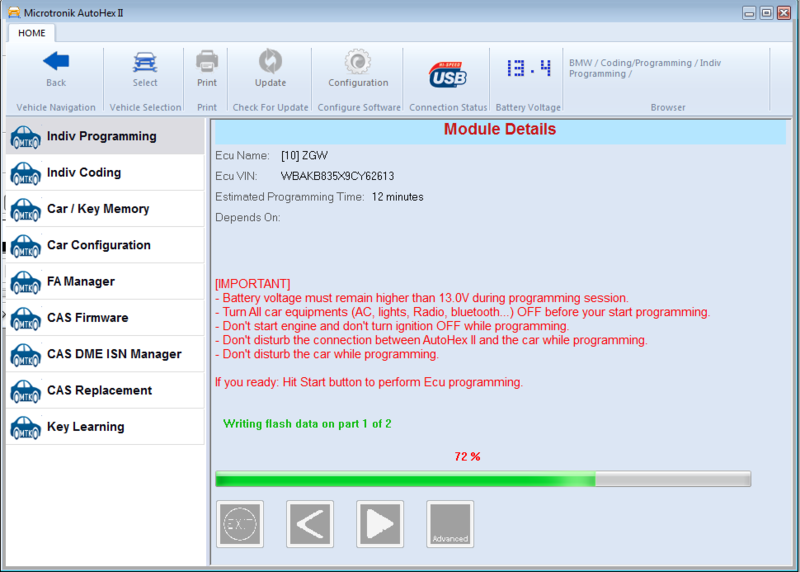 It is important to arrange a good battery booster connected to the car, voltage must remain above 13V during all the programming session, and the laptop must be connected to a charger if the Ecu programming period will take a long time. Few minutes if the car is F series and it is first time to be tested. Few seconds if the car is F series and being tested before. Update Available: This Ecu is compatible with the stored vehicle order in the car, there is an update for this Ecu. Updated: This Ecu is compatible with the stored vehicle order, no update is required as it has the latest version, you can only codes it. Autohex II allows you to jump to next step only if Ecu is compatible, OR marked Replace With if you are in Expert Mode (BMW E series only). The next step will show Ecu details such current VIN, current Part number, Target part number, and Estimated Required Time for programming. Once you click on Start, Autohex II will check the conditions like: Car battery voltage, connection method (USB or Wi-Fi), laptop battery status, then it will download required flashing data from server. If all conditions are pass, then will start preparing vehcile for programming, and starts the programming session afterward. AutoHex II can perform BMW ECU coding individually by selectiong the desired Ecu to encode, this function is used in same manner in both BMW E and F Series. If the status is Not Compatible then you must try to go to individual Programming function, from there Autohex II will try to program the Ecu with the proper flash program and encode it from there. If the status of the Ecu is Not Responding, You can check if Ecu is mounted, and connections are correct. 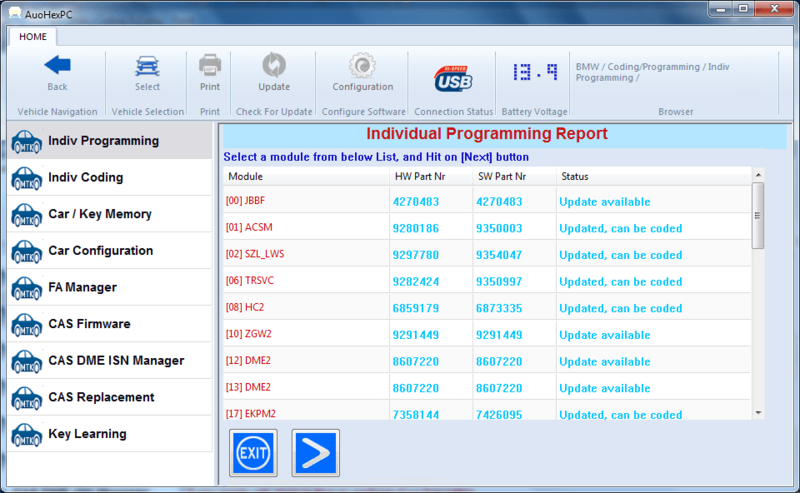 Some Ecus does not require coding like Central Gateway in F Series ( ZGW ), you will get a status like Ecu Has No Coding. One option inside BMW Ecu coding in Autohex II BMW software is the manual coding. Manual coding purpose is to let you able to modify some parameters of the Ecu, for instance: a default parameter value of the occupancy sensor in an Airbag Ecu is active, you can make it inactive. To start Ecu manual coding function, you can select the desired Ecu from the coding list, and then click on Advanced button. The above picture shows that Autohex II BMW Software lets you chose between Auto coding and manual coding, in Auto coding, Autohex II will calculate the Ecu parameters relying of the vehicle order which is stored in the CAS, this will guarantee a correct coding that will let this ecu works perfectly in the vehicle with other Ecus. Manual coding will let you chose among these parameters and do the modification, from the above picture; you note some nodes are red, some are blue. The red means this is what the parameter supposed to be, the blue means it is not the standard. You can use the reset button to return all parameters to the standard values. Autohex II is the best solution for BMW locksmiths who are looking for a single tool that solve all cases in BMW key programming, a tool with a robust functions that will do the job precisely, covering all the cases and able to do job no matter the situation is. With the special functions for BMW key programming and the help of Microtronik HTag Pro key programmer, locksmiths can read, write, block, unblock,save and delete any key in the CAS. Autohex II is an advanced tool for Encrypted CAS (CAS3+), locksmiths can add new key with or without working keys available for all versions of CAS3+. After selecting Key learning from the left list, you will get a list of available functions as in below picture.